This Volkswagen Golf is available in Silver, Black, White, Red, Blue other colours and lease options, subject to availability and includes a warranty. The Golf is better than ever, desirable, refined and a great car to drive, it's one of the best all-rounders, and deservedly was voted Family Car of the Year. The cabin is classy and practical, the residual values are strong, and every car has lots of safety kit included. The Golf is a superb all-rounder that offers everything most families will ever need. Most versions are sensational to drive, blending an extremely comfortable ride with good body control. Offers include petrol and diesel engines, manual or automatic transmission. Which VW Golf are you going to lease today? We offer top quality Volkswagen Golf from brand new, nearly new, slightly used or ex demo, whether you have good or poor credit rating, pay a low or no deposit. These Volkswagen Golf can be leased or financed and come with a warranty, HPI checked and when contract hire leasing, include UK nationwide delivery and AA or RAC Roadside Assistance cover for peace of mind. Time4Leasing can offer you the latest Volkswagen Golf lease deals at lower prices because these vehicles are exclusive and offered at lower rates to customers that have good, poor or even bad credit history score ratings. The Golf’s seemingly effortless combination of space, top build quality and fantastic driving experience makes it a real winner. It holds its value extremely well, too, making it a superb new buy. Volkswagen will pay £500 towards your deposit when you buy using a three-year, 6.3% APR PCP deal through one of its dealers, but the best list price discounts are to be found at brokers. The Golf is a superb all-rounder that offers everything most families will ever need. However, you still need to choose reasonably carefully. Most versions are sensational to drive, blending an extremely comfortable ride with good body control. However, the cheaper versions (both 1.2 petrols and the 1.6 diesel) come with a less sophisticated suspension, and they don’t ride quite as serenely. They’re still more comfortable than many rivals, though. Of the three trims, we reckon SE strikes the best balance between equipment and affordability. This brings alloy wheels, automatic lights and wipers, smarter interior trim, adaptive cruise control and a City Emergency Braking system. Later, the range will expand to include a GTI hot hatch, which uses a 217bhp 2.0-litre turbo engine. There will also be a Bluemotion model that averages 88.3mpg and emits 85g/km of CO2. Hybrid and fully electric models follow some time after. 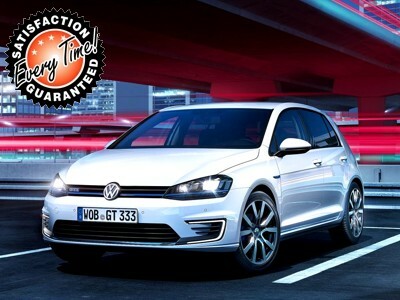 There are 75 Volkswagen Golf Lease Deals on Offer.